The Theory of Justice is one of the most important works concerning moral and political philosophy of the 20th century. 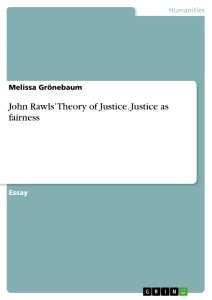 In his work, John Rawls presents a widely persuasive Theory of Justice and elaborates his idea of ‘justice as fairness’. Outgoing from the original position, thus defining a veil of ignorance, Rawls assumes that people would choose fundamental principles which are only for the benefit of everyone and offer no advantages for any special social groups. Rawls expects people in the original position to choose two specific principles of justice on which to found their political association. In this essay I will present these principles and Rawls’ justification for their choice. Furthermore, I will assess his success and will argue for ‘justice as fairness’ being one of the fairest theories on the one hand, but unfortunately on the other hand likewise hard to realize. Regarding the chaotic and socially unfair political system, lined by inequality, greed of power and advantages for those who have money and influence, in “The Theory of Justice” Rawls presents a new and pioneering idea of a fair agreement of justice and legislative. Rawls introduces the so-called original position, involving the elements of the circumstances of justice, the constrains of the concepts of right, and the rationality of parties (comp. Katzner 44), as solution of political injustice: “the essential feature of this situation is that no one knows his place in society, his class position or social status, nor does anyone know his fortune in the distribution of natural assets and abilities, his intelligence, strength, and the like.” (Rawls 12) Beyond this veil of ignorance parties are to choose the basic principles of justice, without being aware of any social status, any conceptions of good or their own psychological propensities. The veil of ignorance “requires individuals to select principles solely on the basic of general considerations by denying them knowledge of particulars.” (Katzner 53) In this way, Rawls hopes, it would be possible to find a fair agreement that benefits all citizens, not only some. If it is ‘purely hypothetical’, why should we take any interest in the Original Position in the world outside? Satan as the Hero in John Milton's "Paradise Lost"
How useful is Rawls’ Original Position for theorizing about a just society?